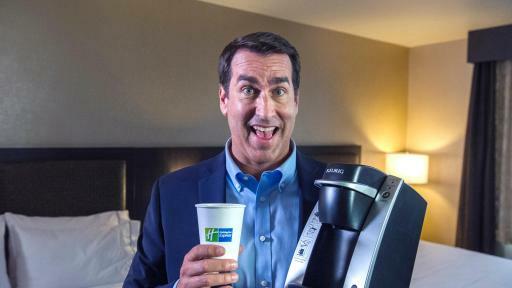 IHG (InterContinental Hotels Group), one of the world’s leading hotel companies, is renewing its relationship with actor/comedian Rob Riggle as the Holiday Inn Express® brand’s first-ever Creative Director. 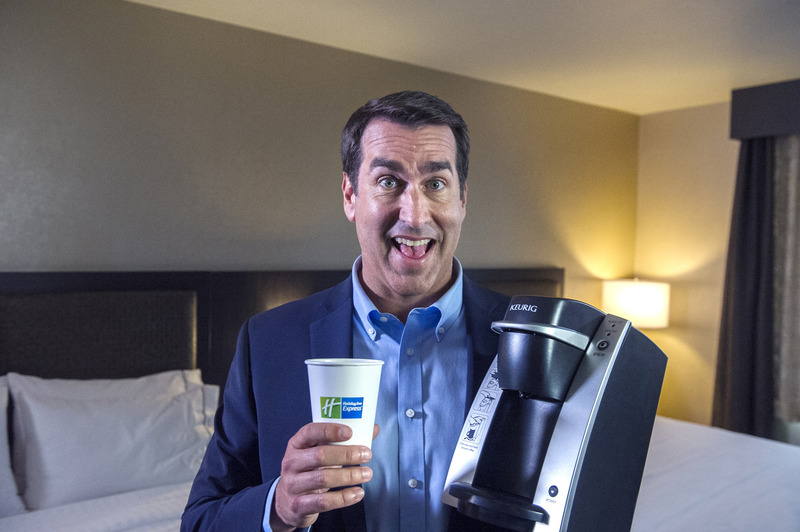 In a role created just for him, Riggle will tap into his wit and “smarts” to showcase the simple pleasures at Holiday Inn Express hotels that help guests enjoy a little bit of nice to help them leave ready for anything – like a restful night of sleep, an energizing breakfast or a good, fast cup of coffee at the push of a button. 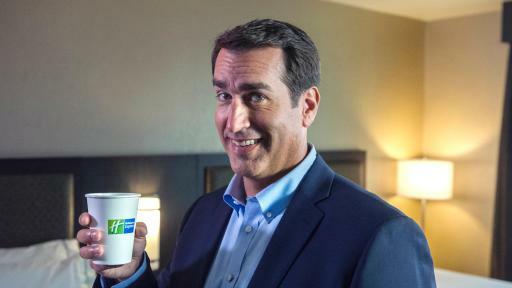 The Holiday Inn Express brand will feature Riggle – actor, comedian and coffee connoisseur – in its latest Stay Smart® campaign spots. 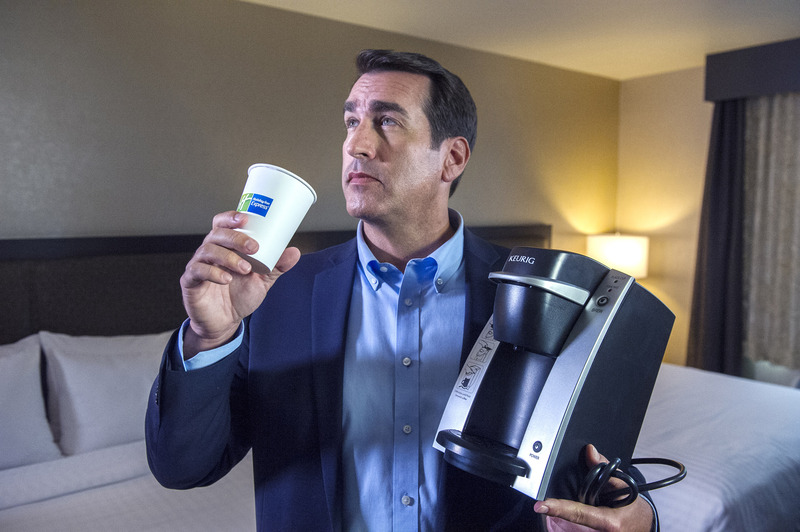 As his first order of business, Riggle is implementing the brand’s new beverage offering – a Keurig® K130 in-room brewing system in every guestroom – making morning coffee intake easier and faster than ever before for Holiday Inn Express guests. The new Keurig brewers are the first of several contributions from Riggle to follow in the coming months. 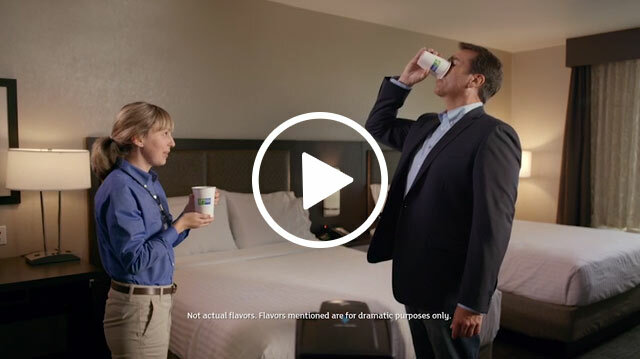 Jennifer Gribble, Vice President, Holiday Inn Express® Brand, Americas, IHG commented: “We are thrilled to have Rob back to lend his humor to the Creative Director role as we launch our newest Stay Smart campaign. 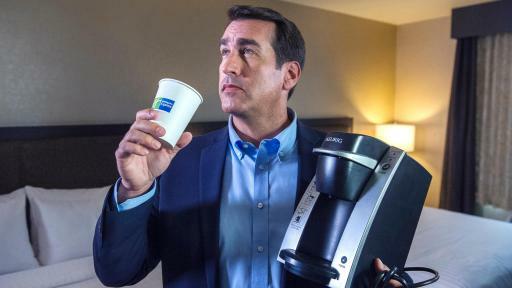 His enthusiasm for all things smart and simple makes him a perfect spokesperson to help roll out Keurig® brewers in every Holiday Inn Express hotel room across the U.S.
Riggle is collaborating with the brand to contribute fresh ideas for how travelers experience the Holiday Inn Express brand promise, which will be introduced in the months ahead. 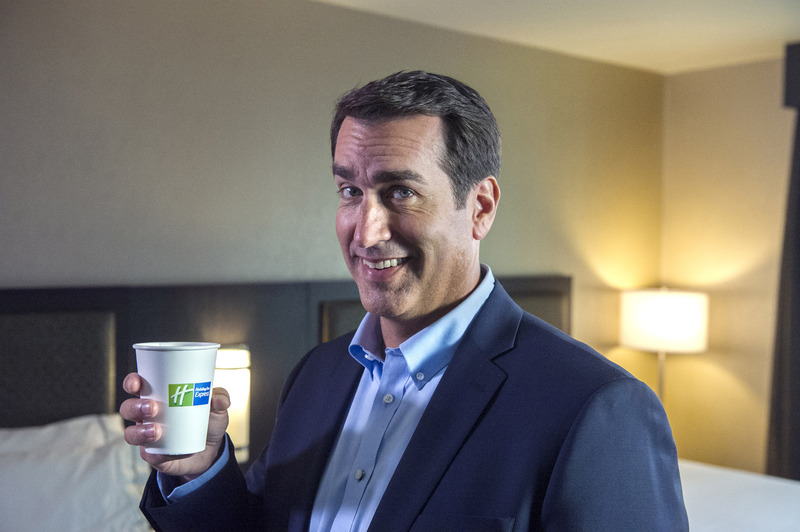 Throughout the spring, summer and fall of 2016, Riggle’s clever contributions will be featured on holidayinnexpress.com as well as the Holiday Inn Express brand’s YouTube, Instagram, Twitter and Facebook pages. Holiday Inn Express® hotels are modern hotels for value-oriented travelers. Fresh, clean and uncomplicated, Holiday Inn Express hotels offer competitive rates for both business and leisure travelers. Guests Stay Smart® at Holiday Inn Express hotels where they enjoy a free hot Express Start™ breakfast bar with new healthier offerings, free high-speed Internet access and free local phone calls (U.S. and Canada only). There are currently 2,425 Holiday Inn Express hotel locations around the globe. For more information about Holiday Inn Express hotels or to book reservations, visit www.ihg.com/holidayinnexpress. Find us on Twitter http://www.twitter.com/hiexpress or Facebook www.Facebook.com/holidayinnexpress. IHG® (InterContinental Hotels Group) [LON:IHG, NYSE:IHG (ADRs)] is a global organisation with a broad portfolio of hotel brands, including InterContinental® Hotels & Resorts, Kimpton® Hotels & Restaurants, HUALUXE® Hotels and Resorts, Crowne Plaza® Hotels & Resorts, Hotel Indigo®, EVEN™ Hotels, Holiday Inn® Hotels & Resorts, Holiday Inn Express®, Staybridge Suites® and Candlewood Suites®. IHG franchises, leases, manages or owns more than 5,000 hotels and 744,000 guest rooms in nearly 100 countries, with more than 1,300 hotels in its development pipeline. IHG also manages IHG® Rewards Club, the world’s first and largest hotel loyalty programme with more than 92 million members worldwide. Visit www.ihg.com for hotel information and reservations and www.ihgrewardsclub.com for more on IHG Rewards Club. For our latest news, visit: www.ihg.com/media and follow us on social media at: www.twitter.com/ihg, www.facebook.com/ihg and www.youtube.com/ihgplc.